Both firms have labelled their new product a “breakthrough innovation” because consumers can open its wine bottle without the need for a corkscrew. The Helix cork and accompanying bottle have a thread finish to allow drinkers to twist the stopper open and closed again, creating an airtight barrier. It was unveiled at the International VinExpo wine fair in Bordeaux today (17 June), and its makers say it could be on shop shelves in Europe within the next 24 months. The design is the result of a four-year collaboration between Amorim and O-I, who are aiming it at the £5 to £10 “popular premium” market. It follows research that found an “overwhelming preference” among consumers for the cork and glass bottle combination. The firms found that 86% of consumers preferred the cork and glass for wine combination. 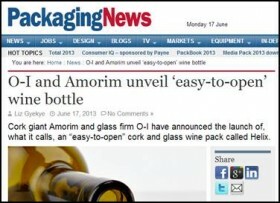 They also said that their new product combines the premium image of cork and glass and the convenience of easy opening. The manufacturers have used agglomerated, or granulated, cork for the design, which they claim offers greater elasticity and reliability than standard stoppers to better protect the wine. In a webcast press conference, both firms said it can quickly and easily implemented by wineries and only minor adjustments are needed on filling machines to make the product. They also said that key bottling line suppliers have “validated the solution”. The groves in the cork also have the “orientation of a cork stopper” according to the firms. Winemakers have increasingly been using alternative stoppers in the form of metal screwcaps or plastic to combat complaints about the inconsistent quality of cork and the resulting “cork taint” – the sour, musty taste that ruins a wine.